Log in to the reseller self-care interface..
Log in to the subreseller self-care interface.. Generate rates for charging customers. 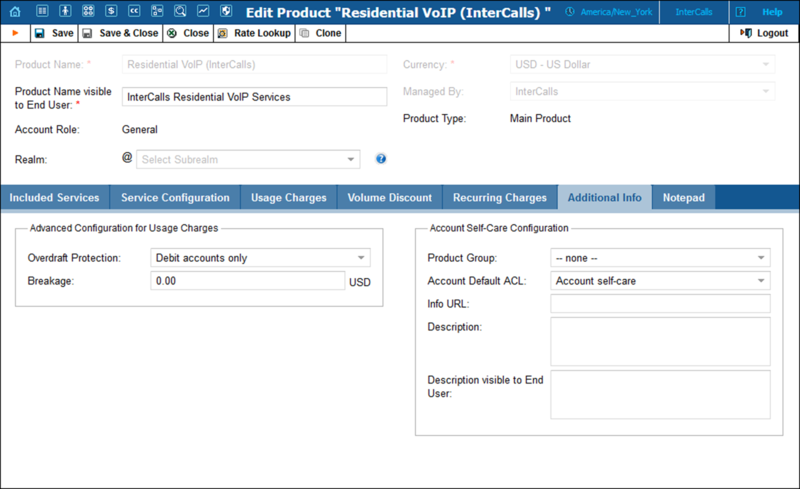 This section demonstrates how to configure two levels of resellers who will be reselling residential VoIP services. Each reseller will act as a “white label” reseller and offer a package of services under their own brand name. Consider the following example: company InterCalls is an authorized reseller of a specific ITSP and sells residential VoIP services to customers. InterCalls is free to establish their own prices on services provided and has the ability to rebrand these services as their own. InterCalls has a partner – Panda Telecom, a local Chinese community that wishes to participate in this business and sell residential VoIP services rebranded under the Panda Telecom name. In this partnership, Panda Telecom acts as a subreseller of InterCalls. 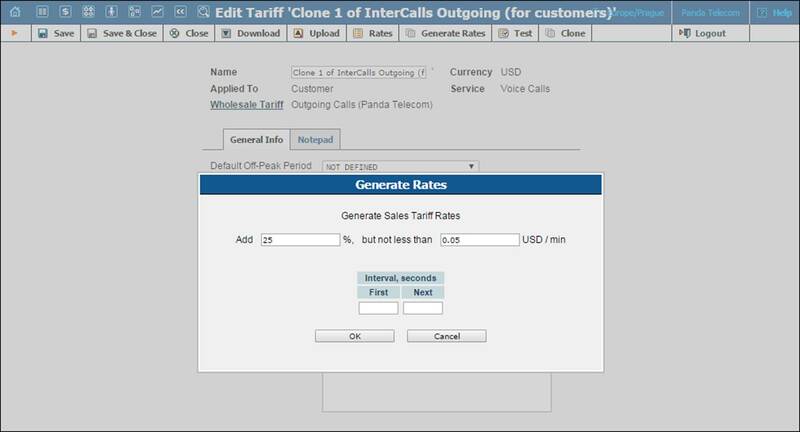 · for the administrator: to configure InterCalls as a direct reseller, create corresponding tariffs and a product for InterCalls. 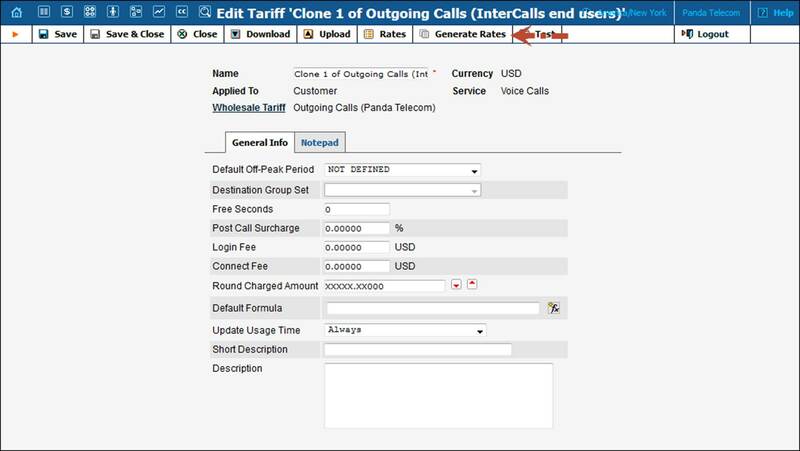 · For the InterCalls reseller: to create Panda Telecom as a subreseller, create tariff(s) according to which Panda Telecom will be charged and provide Panda Telecom with the product. · for the Panda Telecom subreseller: change the name of the product so it corresponds to their brand, define rates that end users will be charged and configure their retail customers. Please use the checklist below to ensure that you have performed all the required operations in the correct sequence. In this handbook, we assume that the InterCalls reseller has already been configured by the administrator. For detailed instructions on how to configure a reseller in PortaSwitch®, please refer to the Configuring a Reseller for Postpaid Services or Configuring a Reseller for Prepaid Services handbooks. Open the reseller self-care page in a browser (by default https://<your-porta-billing-server-name>:8442) and log in with the credentials that were provided to you. NOTE: Sometimes administrators try clicking the Logout button on the admin interface and then log in using the reseller’s username and password. This will not work as you are still in the admin realm, to which your reseller does not have access. You should append the 8442 port log in from the reseller self-care interface. A subreseller is just another reseller (a company or individual) who purchases the VoIP services from a higher-level reseller and provides these services to customers or resells them through other resellers. 1. In the Participants section of the reseller self-care interface, select Subresellers. 2. On the Subreseller Management page, click the Add icon. · Customer ID – Type a short name for the subreseller; this will be used on the web interface. · Customer Class – Select a customer class for this subreseller. A customer class is a set of various parameters that can be applied to a group of subresellers. By choosing a specific class here, the subreseller will automatically inherit all of the class properties (grace period, invoice template, etc.). · Currency – Select the currency in which this subreseller will be charged. · Permanent Credit Limit – Assign a credit limit for the subreseller. Create the resale tariffs and generate the resale tariff rates that the InterCalls reseller will use to charge their subreseller for incoming and outgoing calls. · Resale Tariff Name – Type the resale tariff name here. · Add – Type a profit markup (in percentage) you wish to apply to rates in the wholesale tariff. · but not less than – To reduce the risk of profit loss, type a fixed markup here. It will be added to the wholesale tariff’s rates if the calculated percentage markup is less than the specified fixed markup. · Resale Tariff short Description – Type the resale tariff description. Click the Clone button. Repeat these steps if you need to create more resale tariffs. The product is the main instrument that defines which services a reseller can offer to their customers. To provide the product to a subreseller, the InterCalls reseller clones one of his products. The cloned product becomes ‘at the disposal’ of the subreseller. · Product Name – Type in a name for the subreseller’s product. · Clone Discount Plan– Select this check box if you want to include the original product’s discount plan with the new product. Otherwise, leave it unchecked. · Clone All Subscription – Select this check box if you want to include the original product’s subscription with the new product. Otherwise, leave it unchecked. · Clone Rates – This option is only available if the new product and the original product share the same currency. Select this check box if you want to clone the original product’s sales rates. Alternatively, you can create a new product without defined sales rates. To do this, leave this check box unchecked. · Convert Rates – This option is only available if the new product’s currency differs from the original product’s currency. Leave this option as is if you want to use the current exchange rate. Otherwise, adjust the current exchange rate as necessary. NOTE: If it is impossible to automatically get the current exchange rate, the system fills this field with a 0.00 value. In this case, you need to manually enter the exchange rate. When you have finished, click the Clone button. Specify credentials that the subreseller will use to access their self-care interface. · Login – Type the username that the subreseller will use to log in to their self-care interface. · Password – Type the password that the subreseller will use to log in to their self-care interface. · Time Zone – Choose the time zone in which the subreseller will see their xDRs and which will also define their billing period. For example, if you select America / Vancouver here and the billing period is Monthly, the billing period will start on the first day of the month at midnight (12 am) New York time. · Web Interface Language – Choose the language to be used on the subreseller self-care interface. Information on all the other tabs is optional. A detailed description of these tabs can be found in the Create a Reseller section of the Configuring a Reseller for Postpaid Services or Configuring a Reseller for Prepaid Services handbooks. Open the subreseller self-care page in a browser (by default https://<your-porta-billing-server-name>:8442) and log in with the credentials that were provided to you. · Uploaded from a .csv or .xls file. The rate upload procedure is described in detail in the Rate Import handbook. · Generated during the Clone Product procedure. · Generated by applying a markup (in percentage) to rates defined in the wholesale tariff. The rate generation procedure by applying a percentage markup is described in this section below. 1. In the Rating section of the subreseller self-care interface, choose Tariffs. 2. On the Tariff Management page, click on the sales tariff you want to use for generating rates. The Edit Tariff page opens. 3. If necessary, modify the tariff parameters. Refer to the Create a Tariff for Reseller’s Use section of the Configuring a Reseller for Prepaid Services handbook for more details. 4. On the Edit Tariff page, click the Generate Rates button. The Generate Rates dialog box opens. · Interval First – Type the first billing unit (in seconds) for the new rates. If this field is left empty, the value for the first billing unit will be taken from the wholesale tariff rates. · Interval Next – Type the next billing unit (in seconds) for the new rates. If this field is left empty, the value for the next billing unit will be taken from the wholesale tariff rates. 6. Repeat these steps if you need to generate rates for other sales tariffs. Rebrand the product in order to sell it to customers under your own brand name. 1. In the Rating section of the subreseller self-care interface, select Products. 2. On the Product Management page, choose the product you want to rebrand. · Product Name visible to End User – Type the name of the product that your customers will see on their self-care interface. · Overdraft Protection – Specify how the overdraft protection will be applied to accounts using this product. · Breakage – Specify the minimum amount of funds an account must have to use the services. · Description visible to End User – Provide a product description to be shown to end users on their self-care interface. · Info URL – If you have an external server with a description of product features, enter the URL here (e.g. http://www.myproduct.com). Your customers will be able to go there directly from their self-care page. Create a customer who will be using residential VoIP service. For detailed instructions, please refer to the Create a Customer section of the Configuring a Reseller for Postpaid Services handbook. Create accounts (phone lines) for your customer. For detailed instructions, please refer to the Create Accounts section of the Configuring a Reseller for Postpaid Services handbook.